A few days ago I wrote I was worried that my country would throw our future into chaos based on a fantasy of Greater Britain. And now my worst fears are coming to pass. The vote has gone to Brexit and the fantasy is dissolving before our eyes. The pound’s value has dropped like a stone, and Scotland is demanding to leave the Union. Welcome to Greater Britain. My emotions over the past few days have been cycling through shock, anger, depression, disgust, and abject terror. Looking at the reaction and the voting statistics, what especially appals me is the number of Leave voters who clearly didn’t really know what they were voting for and/or didn’t really think Leave would win, and hence cast a protest vote against the political establishment, without thinking through the consequences. Ironically, in many cases it seems the people who will probably be hurt most by Brexit are those most likely to have voted for it. I’ve seen quite a few people complain bitterly about the Leave voters, in many cases calling them ignorant bigots or worse. This is an understandable reaction – but not a helpful one. There’s a grossly misleading infographic doing the rounds which appears to show that Leave voters hate everything from feminism to environmentalism to the Internet. Studying it more closely, I saw that it actually shows the inverse – ie, that those who hate these things were more likely to vote Leave. But it annoyingly doesn’t give the true numbers behind those headline stats. Intrigued, I found the raw data online and trawled through the massive pdf document to find the truth. And it was quite revealing. For example, one of the most eye-catching figures in the original infographic is the apparent revelation that 71% of Leave voters hate the Internet. Actually that’s a false (if easy) conclusion to draw – it actually shows that 71% of Internet-haters voted Leave. But how many Internet haters were there to start with? Answer: about 600 people, of over 12,000 surveyed, so a mere ~5% of the total. And that 71% of them who voted Leave – that’s only 430 people, or 3.5% of the total. In fact, as I dug further into the data, I found that the picture this survey of attitudes shows is far more encouraging than you might think. And so I’ve made my own infographic, showing how British people view various aspects of the modern world. Immigration is the only issue where more people considered it a force for ill than considered it a force for good. This isn’t unduly surprising considering the scaremongering about immigration in much of the press. 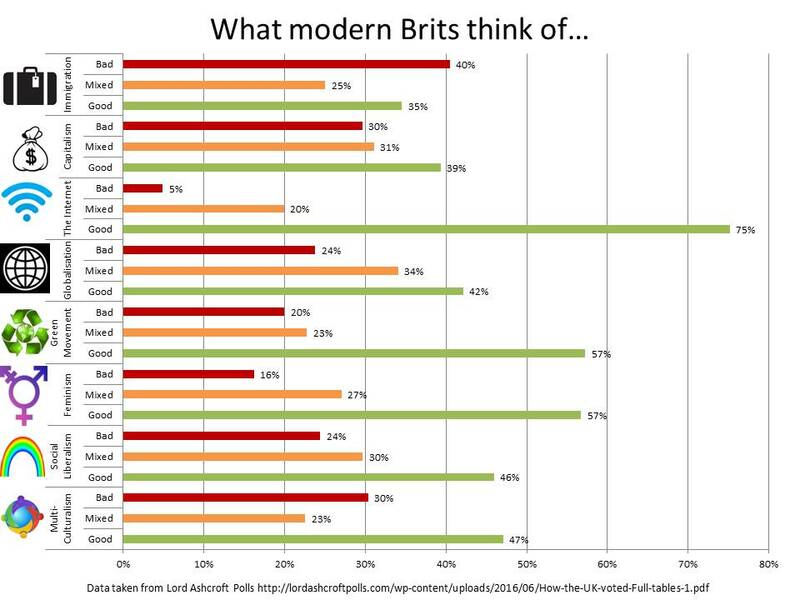 But even here, 60% of British people consider immigration either good or a mixed blessing. The ‘Mixed blessing’ category accounts for at least 20% for each issue, and in some cases over 30%. I find this entirely reasonable given that all these things are complex issues with varied and wide-ranging consequences, and yet this category was completely ignored by the misleading ‘info’graphic. Capitalism and Globalisation are the issues with the highest ‘mixed’ ratings, and the most even split in views overall. This sounds about right to me given their joint potential for both creation and destruction on a massive scale, and the political need to manage that impact carefully – a need which is not currently being met. The Internet is clearly awesome. Feminism and the Green movement are both considered to be Good Things by a clear majority of people, while Social Liberalism and Multi-Culturalism are considered Good Things by very large minorities. And in each case, there’s a substantial minority who think it’s a Mixed Blessing, and only 30% or less who consider it a Bad Thing. On this basis, enraged saddened and disgusted though I am with the referendum result, I’m not giving up hope on my fellow travellers just yet. Footnote: for what it’s worth, my own personal views are that all of these are on balance Good Things, with the exception of Globalisation and Capitalism, which are Mixed Blessings. I seem to be fairly in line with the rest of the population in these views, which I find heartening.